Tessa Virtue and Scott Moir of Canada perform their free dance at 2016 NHK Trophy. Three-time Olympic medalists Tessa Virtue and Scott Moir of Canada continued their comeback successfully with a win at 2016 NHK Trophy in Sapporo, Japan, on Sunday, setting two new records on their way to gold. Current World champions Gabriella Papadakis and Guillaume Cizeron of France had to settle for the silver medal, while the bronze went to Anna Cappellini and Luca Lanotte of Italy. First to skate the free dance of the top three were Papadakis and Cizeron. They opened their routine to “Stillness”, “Oddudua,” and “Happiness Does Not Wait” with a stunning straight line lift that covered the whole ice surface. Although the program looked fluid and the footwork was smooth, there were also a few wobbles, notably on the exit of the curve lift. The lifts and combination spin were rated a level four, and the step sequences a level three, but the twizzles only received a level two. As a result, the two-time European champions remained below their season’s best with a free dance score of 111.06 points. Overall, they collected 186.66 points. The French were already behind in the short dance when their Partial Step Sequence was only rewarded a level two. Virtue and Moir skated after the French team with whom they share the practice ice in Montreal under coaches Marie-France Dubreuil, Patrice Lauzon and Romain Haguenauer. They looked more confident than at Skate Canada four weeks ago, and turned in an excellent performance of their program to “Pilgrims on a long Journey” and “Latch.” The 2010 Olympic Champions picked up a level four for their lifts, the combination spin and the twizzles, and a level three for their two step sequences. The Canadians posted a new personal best of 116.37 points. Overall, Virtue and Moir scored 195.84 points, which is a new record total score. USA’s Meryl Davis Charlie White had set a record of 195.52 points at the 2014 Olympic Winter Games. Moir did not seem very impressed. The Canadians already looked strong in their “Prince” short dance and took the lead by almost four points, setting the new short dance record of 79.47 points. The 2014 Olympic individual and team silver medalists improved their elements and the overall performance level compared to Skate Canada, proving that they are serious about their comeback. The duel between the reigning and the former World champions will now continue at the 2016-17 ISU Grand Prix of Figure Skating Final in Marseille, France, in two weeks as both teams qualified. The crowd really enjoyed also Cappellini and Lanotte’s dance to “Charlie Chaplin,” and the 2014 World champions had the same levels as the winners for their elements. With 180.42 points, they remained in third place. The Italians already ranked third in the short dance with an entertaining blues and boogie woogie routine. 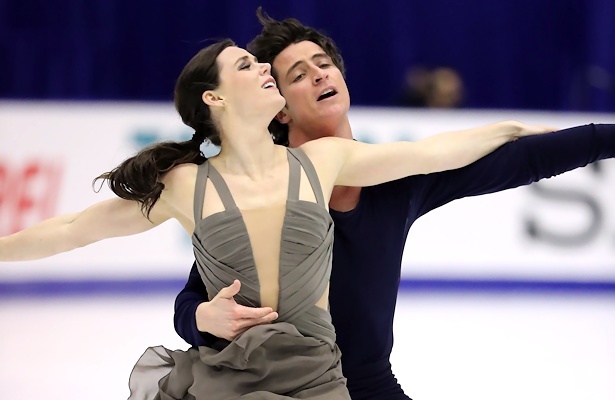 USA’s Kaitlin Hawayek and Jean-Luc Baker gave a smooth performance to “Liebestraum” by Franz Liszt and had strong levels to pull up from fifth to fourth (169.75 points). Victoria Sinitsina and Nikita Katsalapov of Russia performed an expressive Tango routine to “Tango Ballett” by Astor Piazzolla, but the two step sequences merited only a level two and the team from Moscow dropped one spot to fifth (169.62 points). Marie-Jade Lauriault and Romain Le Gac of France looked solid in both the short and free dance to finish sixth, but their curve lift was rated only a level two (149.99 points). Japan’s Kana Muramoto and Chris Reed of Japan withdrew before the competition started on Friday due to injury. Reed had sustained a contusion to his left knee two weeks prior to NHK Trophy.